My hubby and I went grocery shopping yesterday and saw baked beans and both of us commented that we havent had that for a long time now. So we bought a tin and decided to eat that for breakfast today. 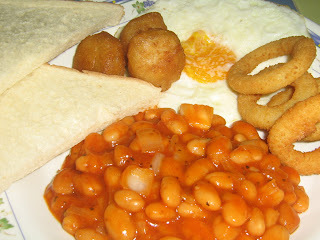 This was our Big Breakfast which consisted of baked beans which I refried with some onions, sunny side up egg, onion rings, fish bites and toasts, we like ours toasted jus slightly.